While walking the path in Richmond Hill, I noticed a lovely orange bird singing a beautiful song on the tree next to me. I snapped a few pictures and continued on my way. I then saw it again further down the patch, then again and again and realized there was more than one of them!! I would say there were at least 6 Baltimore Orioles along the path and I have been walking that path for years and never saw them there before. I hope they stay, they are such a beautiful bird and have a lovely song. Thank you for sending us this report, and also your beautiful pictures of the Orioles - they certainly are lovey, and are one of my favourite birds! 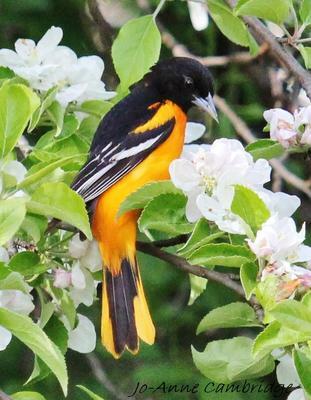 I think the Orioles in your pictures, are all males - beautiful! I lived in Richmond Hill for five years. We had a ravine, a small river (the Don), and many poplar trees in the back of the house. First year we spotted the Orioles, after that each year we fed them. First I put out half an orange, early spring. They found it, and they came to eat daily. After that we bought a feeder. We could still put the orange halves, but it had room for nectar (home made) and grape jelly. We had up to 6 Orioles come to our back yard. The males are orange, but the females are more yellow. Now we live in Uxbridge, and I miss my Orioles. We need to plant poplar trees. They love the hanging flowers in the spring. Well, I didn't know that, about the Poplar trees! You learn something new every day! Spotted two breathtaking birds playing tag among our newly planted redbud trees and hydrangeas. 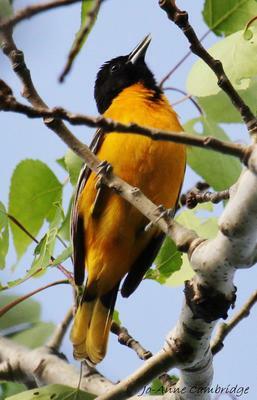 Your page helped me identify them as Baltimore Orioles. As our country garden takes shape, the variety of bird visitors is truly amazing! What a treat for someone who grew up in Toronto. Now in a farming community just west of London. Thanks for your easily understood pages and great photos. 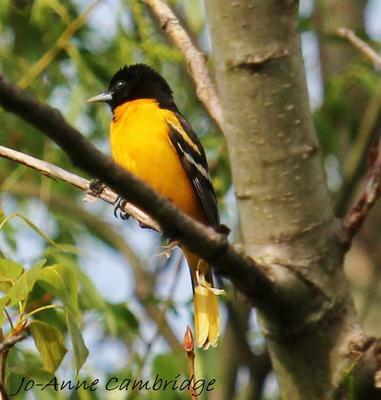 Thank you for telling us about your Oriole sighting - and thank you too for your comments about my website ... I'm blushing! Thank you for posting this. While in a backyard in Whitby this past week, I noticed a bright orange bird which I hadn't seen here before. Thanks to your post, I could not only identify it, but confirm that they're here too! Thank you - I hope they remain... They are beautiful! Just saw a bird at our feeder thought it was Baltimore Oriole but was more red than orange. Could it be one or what else could it be, cannot find good description in my bird books. Had a very distinct song too! Many thanks for any help. Located in Campbellville, South-western Ontario. Very wooded back yard. Could it have been a Scarlet Tanager? Sitting on our front step Ruth and I saw a Baltimore Oriole. I didn't know what it was so I looked it up. Thanks to your website I now know the name of the bird. Now I see there are two of them playing around. I can not get a pic as they are across the road and won't stay still, now a squirrel is chattering away at them. They are trying to procreate. We are in Richmond Hill. I love the photos you captured. There always seems to be little surprises every time you enter into mother natures living space. Thanks.